The project is scheduled to be completed in 18 months. By then, two 8-pile platforms, a 6-pile plat- form, with utilities and pipelines will be installed, and their gas lift, injection, dehydration, NGL extraction and fractionating fa- cilities started up. Several McDermott divisions and subsidiaries will participate in the project's distinct phases. Fabricators at Morgan City, La. 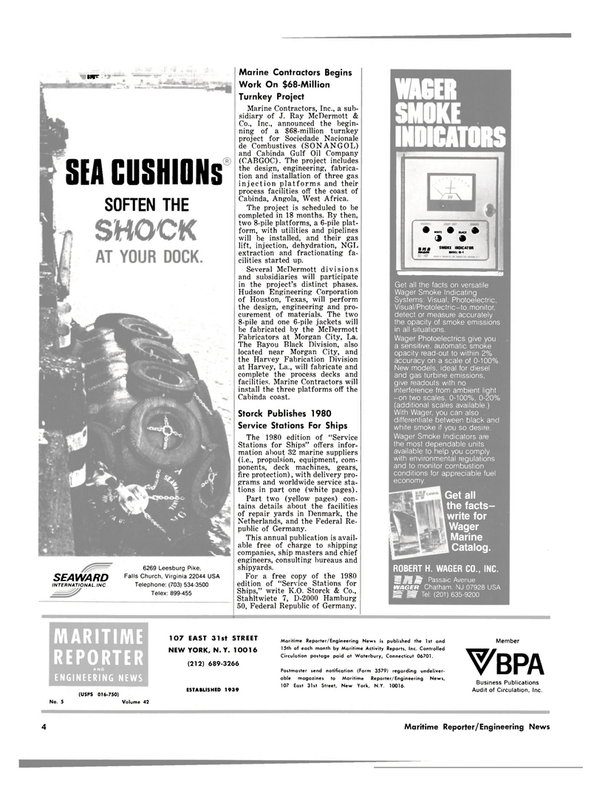 Stations for Ships" offers infor- mation about 32 marine suppliers (i.e., propulsion, equipment, com- ponents, deck machines, gears, fire protection), with delivery pro- grams and worldwide service sta- tions in part one (white pages). Netherlands, and the Federal Re- public of Germany. This annual publication is avail- able free of charge to shipping companies, ship masters and chief engineers, consulting bureaus and shipyards. Visual/Photolectric-to monitor, detect or measure accurately the opacity of smoke emissions in all situations. Wager Photoelectrics give you a sensitive, automatic smoke opacity read-out to within 2% accuracy on a scale of 0-100%. With Wager, you can also differentiate between black and white smoke if you so desire. Wager Smoke Indicators are the most dependable units available to help you comply with environmental regulations and to monitor combustion conditions for appreciable fuel economy. Circulation postage paid at Waterbury, Connecticut 06701. Postmaster send notification (Form 3579) regarding undeliver- able magazines to Maritime Reporter/Engineering News, 107 East 31st Street, New York, N Y. 10016.